Last weekend, I visited one of Shuri's most important historical spots, the Tamaudun mausoleum, final resting spot of the kings of the second Sho dynasty. This large stone tomb was built in 1501 by King Sho-Shin, the third king of the Sho dynasty, to transfer the remains of his father, the founder of the dynasty, King Sho-En, from a grave at Miiagimui to Shuri. However, all of the kings of the Sho dynasty except for King Sho-Tei are burried here, so the mausoleum is regarded as very important remains. Upon entering Tamaudun, a small museum sits on your right. 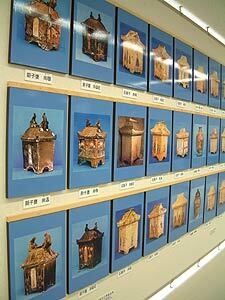 Here, you must pay a small admission of ¥200 for adults and students ages 16 and older and ¥100 for younger children. After paying, the attendant pointed us towards a small museum located downstairs from the admission building. Inside, many historic photographs of the mausoleum were on display as well as a small scale model of Tamaudun explaining the layout of the tomb. 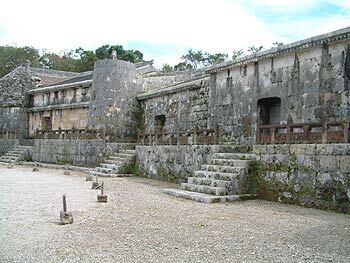 Tamaudun itself has quite a solemn feel with large stone walls separating the mausoleum into an inner and outer court. A stone monument, installed as the result of a household quabble over the inheritance to the trone, sits in the outer court. The names of King Sho Shin and eight people related to the king are engraved on the upper section of the monument. According to the inscription, none other than these nine people would be buried at the mausoleum. The actual tomb of the Tamaudun mausoleum consists of three rooms. By tradition, the center room, called Shiruhirashi, was used for placing the remains of the dead before the bones were washed. The room on the left was reserved for successive kings and queens, and the room on the right was for the rest of the royal family. Also, a sculptured lion and lioness stand at both wings of the mausoleum showing the excellent craftsmanship of the Ryukyuan era. At first glance, both appear to have a menacing appearance, but seen up close, each holds a cord in its mouth and plays with a ball with a humorous expression on its face. The mausoleum itself is quite large reaching about 2,400 square meters. The site isn't exactly easy on the eyes, but it is a very important place none-the-less. Though rigid in look and feel, the craftsmanship that went into constructing Tamaudun was splendid. Due to the remains entombed at Tamaudun as well as the craftsmanship and history behind the giant tomb, the site was designated as a National Historic Monument on May 15, 1972. 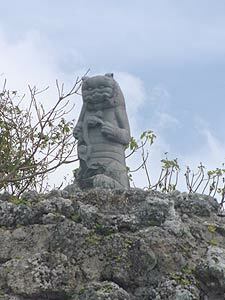 To get to Tamaudun, if you are driving south from Kadena, drive south on 58 towards Naha. Once you get to the Tomari intersection, turn left. Eventually, you'll pass Kokusai street on your right. Continue straight and pass the rt.330 Asato intersection. Up ahead, the road will split to the left you'll see signs announcing the Shuri Castle Park. Follow these signs to the castle and park at the paid parking. Tamaudun sits inside the park grounds.